Joseph Ayodele Ogunwole was born January 10, 1940 in Ogbomosho, Nigeria and recently passed on October 17th due to cancer. From an early age, he showed a passion and love for education with a dream to become a doctor. He attended his early schooling in Nigeria at both a nursing college and later Ibadan University. He was noted for his academic skill, often being recognized as one of the top students in his class. This recognition lead to missionaries supporting his application to attend graduate schooling in the United States. He received a Masters in Chemistry at Long Island University and later a Masters in Chemical Engineering at Columbia University. Despite wanting to return to Nigeria, he took a job with DuPont in Niagara Falls, New York. He stayed with DuPont throughout his entire career and made America home. Joseph spent his +30 year work career at DuPont, building on his early work in Western, NY then moving and retiring to the Research Triangle Park area in North Carolina. He received a number of accolades throughout his career, leading him to manage projects in Japan and Puerto Rico. His managers and colleagues recognized him for his intellect, compassion, exceptional integrity and remarkable ability to teach others. His greatest impact was his dedication to God, his faith, his family and local community. As a deacon at Ephesus Baptist church, he provided a warm, supportive and welcoming environment, encouraging people to feel comfortable and accept the love of Christ. Several members leaned on him for guidance, prayer and love. No task was too great or too small in the name of service to the Lord. Joseph spent countless hours giving his time and money to those in need. He passionately committed his time to serving food at the Interfaith Community Kitchen. He truly saw service as his greatest gift to others. His passion to teach others and connect with people was only matched by his love for his wife, Sarah, sharing 43 years in devoted marriage. Similarly, his friendship with childhood classmate and lifelong friend Dr. Martin Ogundeji transcended boundaries of both time and geography. Joseph was a lifelong learner, avid runner and health enthusiast, traveler and held a deep passion for golf. 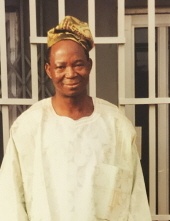 He is survived by his lovely wife, Sarah Ogunwole, his son, Babatunde (Tunde), his daughter Adeola (Addie). His younger brother Adeyoye Solomon and nephews Taiwo, Kehinde and Olusoji who live in Nigeria. His brilliant legacy of faith, hard work, consistency and love will be remembered by those he touched. Joseph provided a ray of sunshine and hope wherever he went through his earnest smile, unforgettable quotes and stories. While he will be greatly missed by his family and friends, his spirit lives on. A memorial service will be conducted 11 a.m. at Ephesus Baptist Church, Chapel Hill, on Saturday, Nov. 3, 2018. Burial of his cremated remains will be in Markham Memorial Gardens following the service. The family will receive friends from 6 to 8 p.m. on Friday at Clements Funeral Home, Durham. To send flowers or a remembrance gift to the family of Joseph Ayodele Ogunwole, please visit our Tribute Store. "Email Address" would like to share the life celebration of Joseph Ayodele Ogunwole. Click on the "link" to go to share a favorite memory or leave a condolence message for the family.